We never knew northern Groningen was such a hotspot for kayaking. When planning a weekend trip to Warffum, we were delighted to discover the province actually has 850 km of canoeing trails. Too bad only half a day’s time was what we had to paddle around. Nevertheless, we encountered some lovely surprises along our trail (14 km return). We departed from camp Zuiderhorn, conveniently a camp site and kayak rental in one. Our destination was tiny village Onderdendam, where we planned to take a lunch break and from there paddle back the same way. Halfway along the route we passed an ideal picnic place for kayakers. Moving on, stared at by a number of cows, all of a sudden a magnificent windmill appeared on our right. We had to take a closer look, however turning the kayaks around in the narrow canal was tricky. Reaching Onderdendam we left our kayaks at a dock and made our way to yet another windmill housing a restaurant. The village has <700 inhabitants and its monumental buildings are protected by law. Onderdendam was apparently named in the 13th century, meaning ‘a dam built in marshy land’. 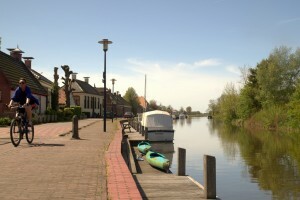 The wide canal running through the village indicates that shipping transport once was important. Nowadays it seems to be used by recreational boating mostly. On our return we couldn’t help making a small detour to the harbour of Warffum, attracted by the idea of a cold beer on a sunny terrace. It was a missed opportunity that the municipality nor the local restaurant had provided for a canoe dock, so we had to go back to the kayak rental first. 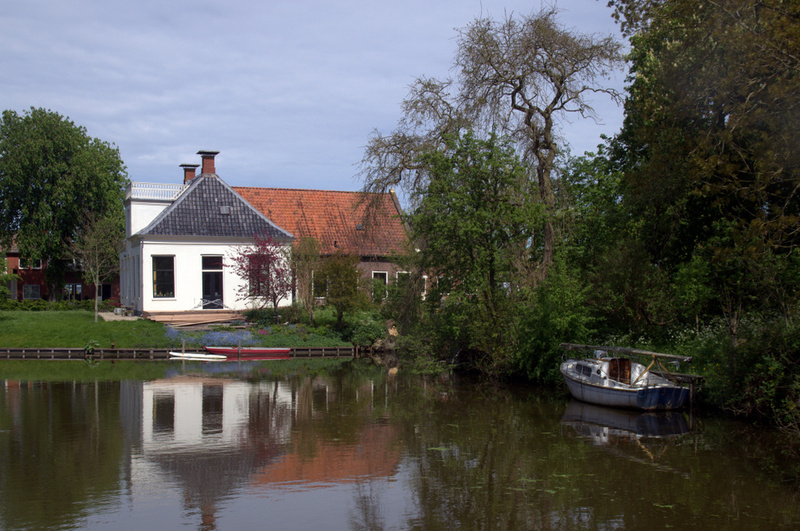 Consider combining your kayak adventure with a visit to Warffum’s open air museum Het Hoogeland and a stroll through its picturesque, tiny village center. We did this charming hike in the surroundings. You can stay the night at one of the B&B’s in town or pitch your tent at camp Zuiderhorn. The camp site also has a few huts to sleep in. Costs: kayak rental €5/hour or €10/day if you are a guest at camp site Zuiderhorn. Address: Camp Zuiderhorn, Onderdendamsterweg 2, Warffum (53.384909, 6.560521) for kayak rental and dock. It’s a 15 minutes walk from railway station Warffum (53.390423, 6.567061). More info: the owners of camp site Zuiderhorn can provide you a map and advice on a nice short or long route in different directions. If you have a full day, consider the 20 km tour via Onderdendam and Middelstum. Bring: camera, picnic and sunscreen/rainproof jacket.